I have been doing nails for nine years. My husband and I started dating our junior year in high school. After graduation I took one semester of college to become an art major but I just wasn’t feeling it. I went on to nail school shortly after and we had our son Tucker in 2009, and in 2014 we were blessed with our daughter Zoey. Doing nails has always been my passion. I love to pamper others and bring out my creative side. 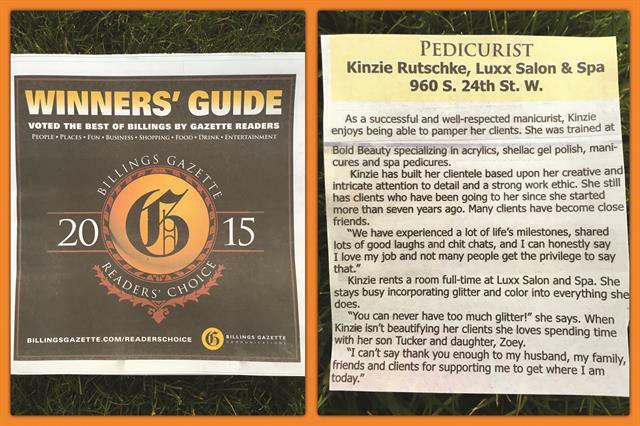 I was thrilled to have won Billings Best Pedicurist award via Billings Gazette Readers Choice in our local newspaper in 2015. I rent a room full time at Polished Salon and Boutique in Billings, Mont. What are your health challenges? I have always been a fairly healthy person. I started gymnastics at 2 years old and competed until the beginning of my freshman year in high school. After having our son, I was still building my clientele and wasn’t as active, but before we had our daughter I knew I wanted to get in better shape so I started out with daily walks and the Beach Body programs at home. Eventually, I got bored with that so I thought I would pick up running to change it up a bit. My health goal is to run for fun several days a week and stay in shape. What was/is your plan of action? I try my best to eat at least a small breakfast each day, especially on my run days, which are two days a week. For run days I generally have oatmeal, a banana, yogurt, a tablespoon of peanut butter, and some water an hour before. At work I always mark out a lunch break or I’ll end up working straight through. For lunch I mix it up between leftovers from home, salads, wraps, meat and cheese, and nuts and fruits. I keep a snack box at work so if I’m between clients the last half of the day I have something to eat since my days are usually 10 hours — sometimes longer, sometimes shorter. I run on Fridays and Sundays, occasionally also a Tuesday if I can sneak in a short one before work. I also do the elliptical at home if I can’t get in my runs. My guilty pleasure is having a gourmet coffee each day on my way to work. How long have you been working on your “plan” and what have been your results so far? What further health and fitness goals do you have and how do you intend to reach them? 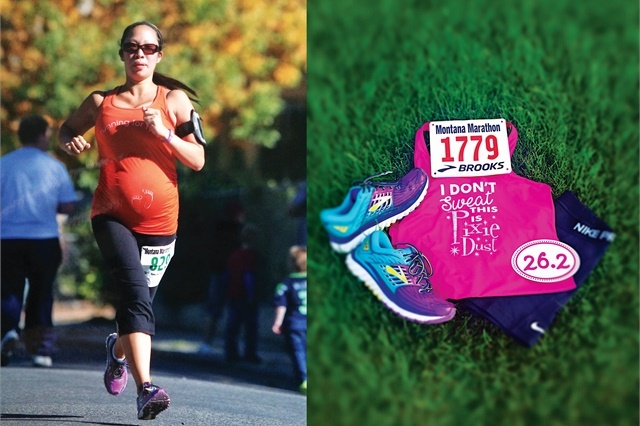 I began walking about four years ago and that developed into running in the last two and a half, but I didn’t have a goal until I did my first 10k at almost 35 weeks pregnant. I decided that the next year I’d do a half-marathon, then one year later at the half, I decided to run the full 26.2 mile marathon the following year — just within two years of running my first 10k. So then it began — many runs, slowly adding more distance each time. I was so nervous that I wouldn’t be able to do it that I didn’t even sign up until a few weeks before the race. But by gosh, I did it and amazingly had no blisters and wasn’t even sore the next day. Please share your advice for other nail techs who need encouragement to embark on a healthy lifestyle. It is possible to sit all day and still be fit. Time management is key. Make it a point to get in some exercise; block off the time in your schedule. Definitely eat healthy and stay hydrated. I work about 50 hours a week (I even cut back from about 60) and manage to make time even with two busy kids. Just tell yourself excuses don’t burn calories and even a little cardio is better than nothing at all. Start out by setting small health goals by eating better and exercising and just go from there. Everyone has to start somewhere on their journey to a healthier lifestyle one step at a time! Are you a healthy nail tech? Every month, NAILS will feature one nail tech in a monthly column devoted to shining the spotlight on your health and fitness success! Even small steps are big steps in our book. 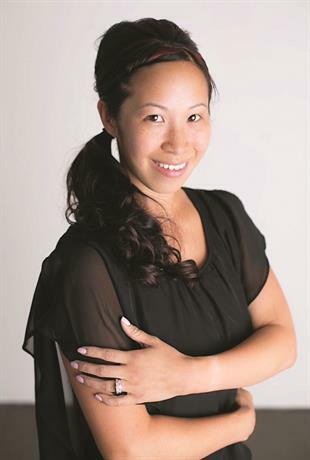 If you would like to share your success story (overcoming health issues, weight loss — any health-related triumph) with NAILS readers, email [email protected] to find out more about how YOU can be featured as a NAILS’ Healthy Tech.